The Sluggers softball team was established in 2008 and was originally named the Smith Sluggers after our team sponsor Smith Engineering Company. Smith Engineering is also where we received our team color of green. The Sluggers received a second place trophy in the 6 & under division in 2008, a first place trophy in the 6 & under division in 2009, and a second place trophy in the 8 & under division in 2010. The Sluggers strive not for the win but the good sportsmanship between girls and other teams, as well as excellent technique to allow the girls to continue to perform at a high level and remain safe in their playing career. 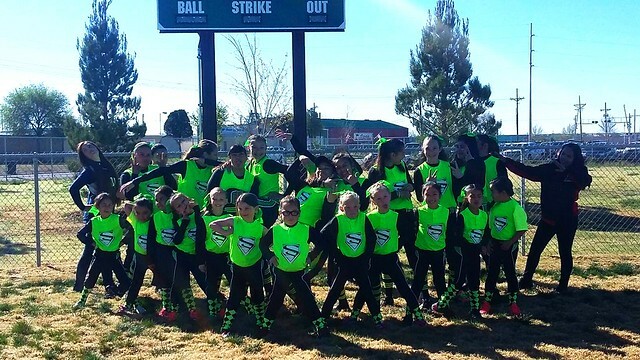 The Sluggers coaches work hard in order to provide a family atmosphere that will allow the team to bond both mentally and physically on and off the field. Every year the Sluggers team is proud to welcome back a large number of returning team members. The amazing support of our Slugger parents, grandparents, and friends has made the Slugger family dynamic possible. Without this fantastic help and backing the Sluggers Softball team would not exist. The support of the Slugger team by our family and friends has been so great we have decided to begin grooming the next generation of Slugger. Our littlest one has been on the softball field since she was just a few weeks old. It’s time for us to start over and get a bat in her hand. What a great site for your team! My daughter just started playing U10 softball and she loves it. Thanks so much for visiting our blog! Thank you for commenting on my daughter’s softball pictures. It is such a great game . . . so fun to watch! Don’t forget to take a light sweater – it gets a bit cool down there. Maybe stay a little late and watch the bat flight in the evening – it’s “cool” too. Ron – left-handed first baseman 75% of my life…so far!